Description: A fast, light and efficient clipboard manager by Xabier Payet. 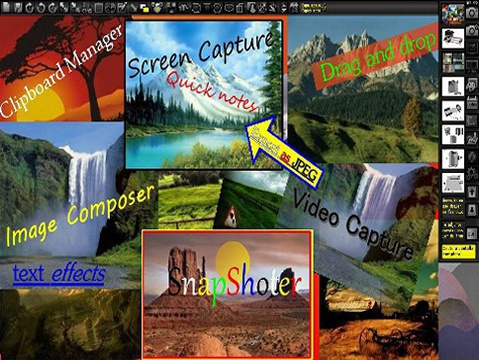 Snapshoter is a infinite clipboard manager, image composer, have post it function and a lot more. 6. Auto store text and images in clipboard from any program to paste again in other program. 12. You can delete or add files directly the captures drawer, snapshoter sort all those files and prepare it. 13. Languages English, Catala , Spanish, Turkish, Italian, Portugues brazilian, Norwegian and French. 14. Drag n drop picture files to the clipboard bar and automatically you have all the images ready for work. 18. Infinite layer image mode. The image blinks to locate the selected layer and make easier the location in the collage. 24. Full advanced clipboard over the cloud store system (Using Dropbox). Share any image or text file between devices anywhere. * Old message changed stored*export when you press left mouse button over any thumbnail to export. * Added Right mouse button over SCALE and ROTATE buttons in collage to change only 1 degree, position per click. * Added Skins system, you can use the template inside the skins folder and modify it to do your own skin. * Text and image clipboards improved and fixed the extension problem with dropbox. * Full cloud support Computer-Cellular-Tablet <-----DropBox-----> Computer-Cellular-Tablet. * Added output format images, now is possible capture in BMP, PNG, ILBM, GIF & JPEG. * Added export clipboard option, press 2 seconds over any clipboard icon in snapshoter to save the clipboard to anywhere. * Added New video options, output file .avi or .gif, frames per second (fps), with or without mouse pointer. * Added the possibility to change the captures drawer place in the hard disk, make a file called dir.txt where the snapshoter executable is placed and write the new location here. * Maybe i finish some new functions as the navigation by days, not using an only folder with all the files.